In 1924, Herbert Landin founded Herbert Landin Domkraftfabrik (”Herbert Landin Jack Factory”), at the time only 22 years of age. Initially, the sale of metal shoe sole protectors contributed to the actual operations - manufacture of mechanical jacks. Towards the end of the 1920s, the company started delivering mechanical jacks to Volvo, the company's first major customer. 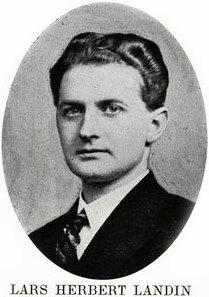 Herbert Landin was at the time the first to manufacture jacks in Sweden, which were marketed under the brand name NIKE. In 1932, the first hydraulic jack was manufactured, and at the same time first OEM agreement was signed with Volvo Trucks. The business was incorporated in 1937, and changed its name to Domkraft AB NIKE (“Jack Company NIKE”), which was the name and brand that would be used for a long time to come. The business moved to new premises at Kungsgatan in Eskilstuna, and the entire staff was 12 people at this time. In the 1930s, hydraulic barber chairs were launched - a classic blockbuster product that is still in use at many hair salons. The barber chairs were produced and sold for many years. They are like vintage cars now - more and more sought after with time! During the late 1930s and early 1940s, the sales volumes increased substantially, and the proportion sold on the European market was growing. This led to the hiring of an export manager in 1940, who laid the foundation for a massive sales increase in the Western European market. The business was continually developed and the company also started its own foundry for mechanics. The orders continued to increase, and at midsummer 1941, the company was acquired by Kooperativa Förbundet (“Swedish Co-operative Union”), today best known for its groceries subsidiary Coop. Significant investments were made in both machinery and buildings, and new products were added to the line. During World War II, NIKE was delivering products to the Swedish Armed Forces, including the production of grenade bodies and breaches for cannon carriages. After World War II, the construction side of the company was strengthened considerably, as a result of the company's investment in heavier hydraulics - shoe sole pressing machines for the leather industry, abrasive wheel manufacturing with capacities of 300-500 tons, climbing jacks for silo plants, shipyard jacks, aircraft jacks, gantry jacks for the Swedish train industry, pole jacks for the Telecommunications Authority and much more were constructed during this time. The product line grew, and the company's turnover and market share with it. The years 1956-57 are milestones in the company's history. This was the time when the "giant lift" of the 3 200 ton heavy water reservoir was performed at Örebro water tower – at that time a lifting record. The lift was carried out in stages of 10 cm, and the total lift from the ground was 33 meters. In the mid-1950s, a new product family was developed which would be another long-lasting success - hydraulic drawing boards. They were manufactured in a variety of designs, such as President, Medium and Nikette. In 1958, 196 people were employed in the workshop and 82 people in the foundry. In the same year, the production of standard jacks was moved from Kungsgatan to Björksgatan, both in Eskilstuna, Sweden. During the 1960s, a more uniform industrial program was developed consisting of high pressure hydraulic pumps and cylinders. It was used early for, amongst other things, alignment of collision damaged automobiles, such as alignment benches for passenger cars. During the decade, an OEM agreement was also signed for the delivery of jacks to Scania. The production premises became too small for the company, and in 1968 a new building was purchased in Vilsta in Eskilstuna, where the majority of the hydraulic production was moved. In 1976, NIKE became a part of AB Bygg- och Transportekonomi (“Building and Transport Economics”), a company within Kooperativa Förbundet (“Swedish Co-operative Union”), which is best known for its production of forklifts. The main idea was that NIKE's knowledge of hydraulics would be utilized, for example in the production of pallet trucks and hydraulic units for forklifts. 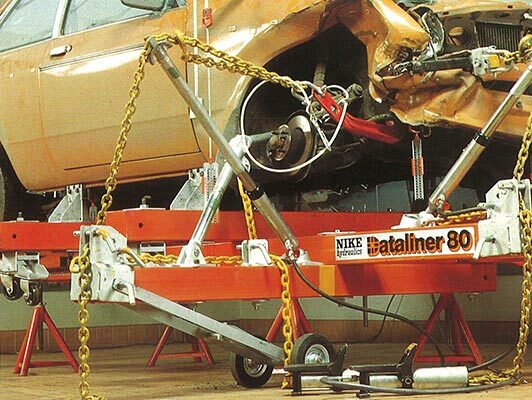 During the same period, the production of garage jacks accelerated and the I-PAK program was launched. A new milestone was passed in 1977, as a new lifting record took place when the 10 500 ton heavy water reservoir was lifted during the construction of a water tower in Saudi Arabia. In 1980, the company reached yet another milestone - 20 million manufactured jacks. In 1981, the alignment systems Powerline and Dataliner were sold to AGA Geotronics / Nicator, who continued the development of this product line. In 1986, Kooperativa Förbundet (“Swedish Co-operative Union”), sold NIKE to private stakeholders divided into three parts: contract manufacturing for BT to one stakeholder, the foundry business to another, and finally NIKE itself to a third stakeholder. In 1988, NIKE acquired the competitor Bahco Kraftverktyg (“Bahco Power Tools”), an acquisition that also included a product line of hydraulic rescue tools. The coming years were turbulent, and were characterized by several restructuring and ownership changes. It culminated in the fact that NIKE's parent company, after various real estate speculations, went bankrupt in 1992. But from the ashes, NIKE Hydraulics AB rose in 1993 with three product lines: industrial hydraulics, rescue hydraulics and hydraulic lifting equipment. The foundation for what was going to become today's REHOBOT Hydraulics AB was laid. During the 1990s, NIKE established subsidiaries in the United States (NIKE Hydraulics Inc.) and England (NIKE Power Equipment Ltd). During this time, NIKE's quality management system was certified according to ISO 9001. NIKE supplies hydraulics to a 32 000 ton press machine used in the European laboratory for particle physics at CERN, Switzerland. NIKE's environmental management system is certified according to ISO 14001. Volkswagen, Ford, Scania and several other automotive customers choose NIKE as their OEM supplier of hydraulic tools and jacks. At the same time, the company was in need of additional business space and therefore purchased a production facility of 8 000 square meters in Eskilstuna, Sweden. In 2010, NIKE Hydraulics went bankrupt because of insolvency. The industrial company group Obadja acquired the bankruptcy estate and changed the company name to REHOBOT Hydraulics. REHOBOT introduces a production philosophy based on LEAN. In 2011, some fixing elements on a segment of Ölandsbron (“the Öland bridge”) were changed using equipment from REHOBOT Hydraulics, when four CX cylinders were used together to accomplish a lifting capacity of 1000 ton. REHOBOT Hydraulics sells products to customers in over 50 countries around the world. Since Obadja's takeover, the company has had good profitability every year. The company now has new stronger owners, an ambition to grow and develop and above all a bright confidence in bringing the company's exciting and energetic journey forward.